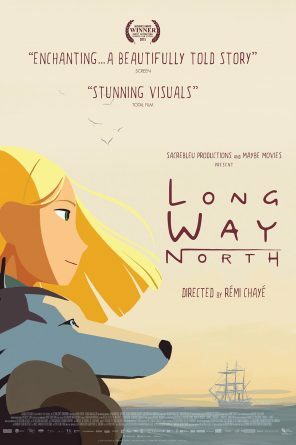 Check out our review of Long Way North - is it any good and how suitable is it for kids? A beautifully animated Russian adventure that has already won the Audience Award at the 2015 Annecy International Animation Festival, Long Way North is the story of 15-year-old Sasha, who embarks on an adventure to find her lost grandfather. He’s an explorer who went missing during an expedition to the North Pole, and Sasha is determined to find him and his ship, the famous Davai. Because it is set in the Russia of 1882, Sasha faces many challenges, including the disapproval of everyone who thinks a young girl should not embark on such an adventure. It’s partly a coming-of-age story for her, as well as a lovely story with an interesting historical setting. A really enjoyable movie for older kids with a sense of adventure. There is a sad scene later in the movie that may upset younger viewers. Sasha and her crew are sometimes in danger but it is never truly scary.